This is a book about a team of scientists and psychics with top secret clearances. For more than forty years, the U.S. government has researched extrasensory perception, using it in attempts to locate hostages, fugitives, secret bases, and downed fighter jets, to divine other nations' secrets, and even to predict future threats to national security. The intelligence agencies and military services involved include CIA, DIA, NSA, DEA, the Navy, Air Force, and Army-and even the Joint Chiefs of Staff. Now, for the first time, New York Times bestselling author Annie Jacobsen tells the story of these radical, controversial programs, using never before seen declassified documents as well as exclusive interviews with, and unprecedented access to, more than fifty of the individuals involved. Speaking on the record, many for the first time, are former CIA and Defense Department scientists, analysts, and program managers, as well as the government psychics themselves. Who did the U.S. government hire for these top secret programs, and how do they explain their military and intelligence work? How do scientists approach such enigmatic subject matter? What interested the government in these supposed powers and does the research continue? 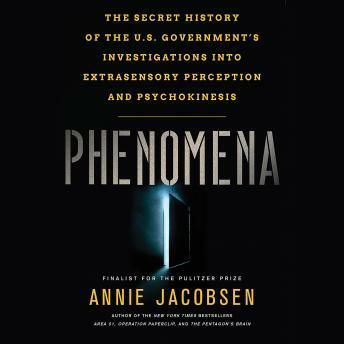 Phenomena is a riveting investigation into how far governments will go in the name of national security.